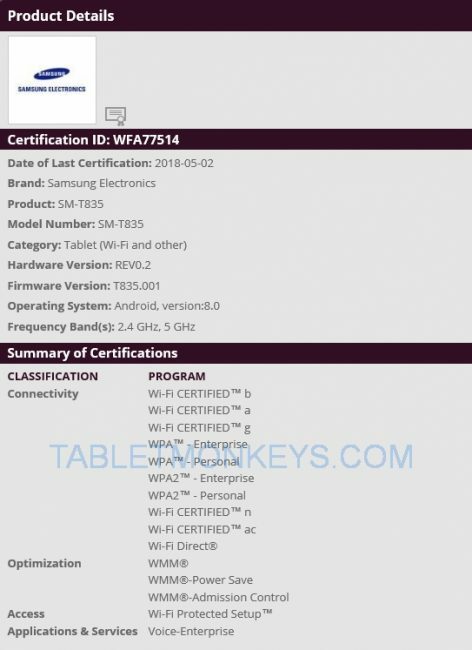 The first official certification for the Samsung SM-T835 tablet came in today after it had been certified by the Wi-Fi certification body with 2.4 GHz and 5 GHz 802.11 a/b/g/n/ac Wi-Fi cover and Android 8.0 Oreo today on May 2. Because of the model number, this tablet is believed to be the new 10.5-inch Samsung Galaxy Tab S4 tablet, since SM-T830 for a Wi-Fi model and SM-T835/SM-T837 would be the normal 4G LTE model numbers in the Samsung Galaxy Tab S family of Samsung’s flagship tablets with Android. We first discovered Samsung Galaxy Tab S4 during the winter after it had been benchmarked with a 10.5-inch screen featuring a 2560 x 1600 resolution and possibly the popular Qualcomm Snapdragon 835 processor. Samsung’s high-end tablets sells well when they run Qualcomm processors, but we don’t know if Samsung will use the same processor on separate models. The 4G LTE model of Samsung Galaxy Tab S3 is powered by the Qualcomm Snapdragon 820 processor. Based on the todays Wi-Fi certification, it’s difficult to predict when the Samsung Tab S4 might be launched. The shortest distance between a certification and launch for a Samsung tablet has been two weeks in the past. But the Tab S3 was unveiled on February 26 last year, so it’s already been 15 months since we saw a new Android tablet with OLED display from Samsung. An unveiling anywhere between May and June seems plausible for the Tab S4.